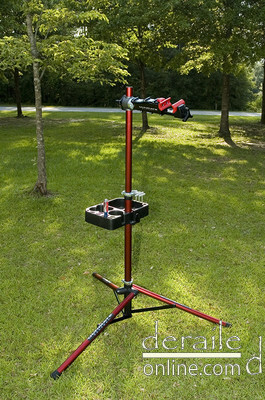 Ultimate Support introduced a revision to their everpopular pro repair stand in 2005. The new stand incorporated a completely new clamp and a few other subtle refinements. 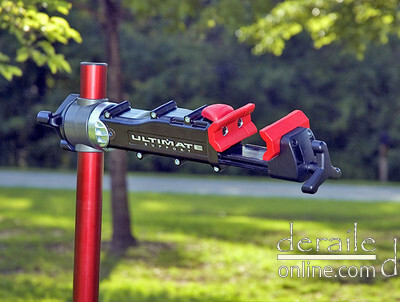 Ultimate Support listened to their customer base and designed a new clamp that is even easier to use than previous clamps. The clamp still uses the same basic sliding jaw design but now has a larger throat capable of clamping tubing as large as 3� in diameter. The round rubber knobs are gone on both the jaw and the rotation clamp. Replacing the round knobs are easy to grasp three way spinners � a modification many users did to their old pro repair stands. And the last but certainly not least improvement is the spring loaded quick release. On top of the new clamp is a go-go-gadget large rectangular button. 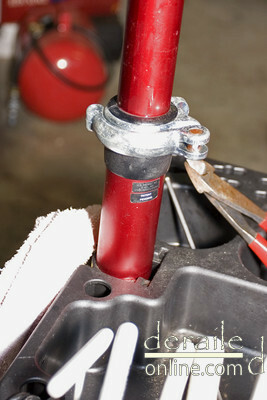 Pressing it explodes the clamp into the fully open position. One other less noticeable change is new sleeves in the main mast that adjust the height of the stand. 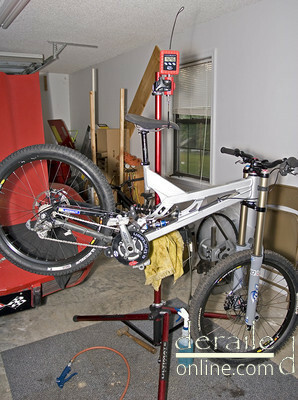 Operation of this stand is even easier than the previous stand and clamping bikes with strange and/or large tubing is effortless � a blessing for DH bikes. 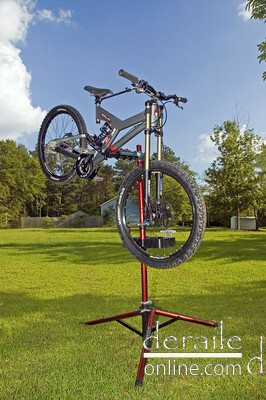 The new stand has a generous weight capacity of 60 lbs, enough to hold any hucker-bra�s big bike. Even with 60 lb capacity the stand still weighs no more than 13lbs. The new Pro stand took every bike I threw at it in stride. Multiple downhill, XC, and jumping bikes were built and repaired on the new Pro stand with no signs of weakness. The new sleeve on the vertical member gives a positive connection between the lower mast and the upper mast - a small problem the previous stand had. 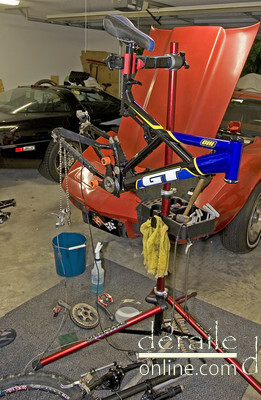 After using this stand extensively for a year, there has been no sign of play or degradation of the clamp operation. If you are an owner of previous Ultimate repair stands you will be happy to know that all of your other attachments will fit this new stand. The new clamp is even compatible with old stands so there is no need to purchase an entire new stand to get the new clamp (also available for Park shop stands). Function of the new stand far exceeds the previous stand. If you remember, I gave the previous Pro stand a raving review and the Ultimate did not disappoint and further improved on all ready good design. The quick release button is golden. Unlike other quick release clamps we have seen from other manufacturers, this one is spring loaded, allowing for one handed operation � a great feature when you have a bike in the other hand. 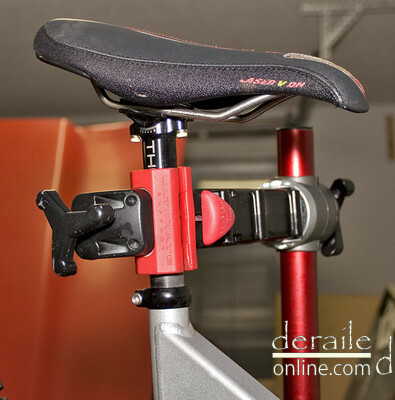 The quick release can also be used when removing the bike from the stand by loosening the clamp to a point where the bike starts to move in the clamp. The rotation of the new clamp is also great. My previous stand required regular cleaning and lubing to keep the clamp from becoming stuck if I tightened the rotational clamp down to keep a bike from rotating while I was working on it. The new clamp does not stick and allows for free movement once released. Ultimate�s high quality tote bag still remains the same and the new stand slides inside easily. If you ever purchase an Ultimate folding stand do yourself a favor and get the bag with it. It turns out that bag is very useful for transportation and storage. The material the bag is constructed with is thick and padded which protects your stand from rough treatment on road trips or plane flights and it doubles as luggage for your stand. 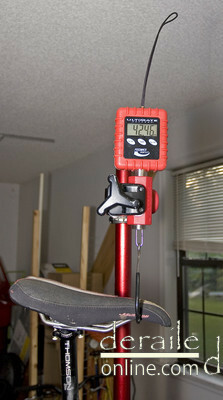 An added option is also a hanging scale specifically designed to work with repair stands. 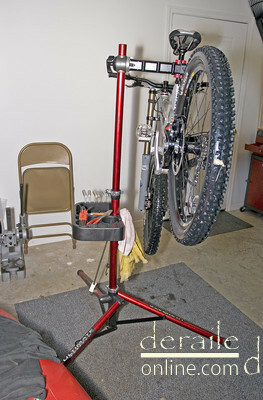 The scale has a round metal clamping surface that can be clamped in any bike rack. The part of the scale containing the LCD screen and buttons is ruggedized with a rubber coating as well as the hook. Final words� Ultimate took a good product and made it even better. Often copied but never imitated, Ultimate has raised the bar again. Scorecard: 10 out of 10! Posted on Sep 24, 2006 22:46:43 -0400 by Brady.